The Dashboard provides a much clearer view of the FITARA Scorecard–released twice a year by the House Committee on Oversight and Reform to rate Federal agency progress on key IT goals–by using dynamic visualizations that allow users to compare their selected agency to the other 23 CFO Act agencies, as well as the Federal average. It includes graphs that break down the subcategories of the FITARA Scorecard, as well as agencies’ overall progress throughout the history of the Scorecard. By highlighting specific agencies, you may even get an idea of the agencies that are likely to win awards at MeriTalk’s FITARA Awards on February 6. One example of an agency that made significant progress is the Department of Health and Human Services (HHS)–the agency with the most improvement in the seventh iteration of the Scorecard. Through the Dashboard, you can get a clearer picture of how much the department has improved. While HHS received its own explainer during the Scorecard, the Dashboard draws an obvious contrast between the department’s results in 2017 and 2018. 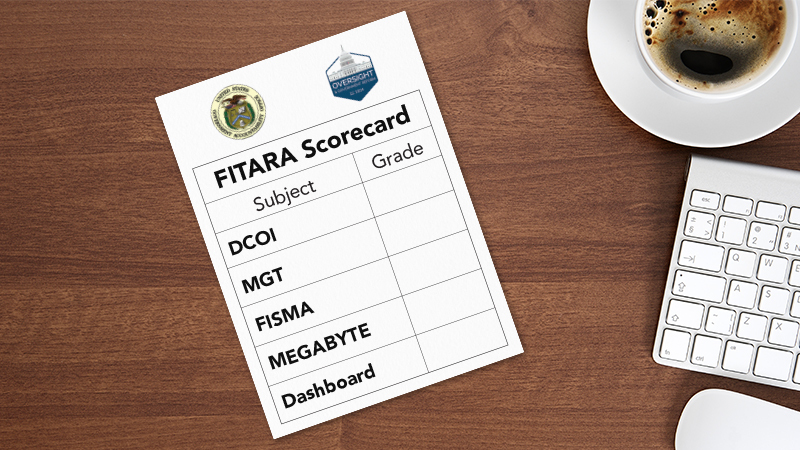 As the visualizations show, HHS’ progress over the last two FITARA Scorecards is impressive, bolstered by a strong push to get “A” grades in the areas of software licensing, portfolio review, transparency and risk management, and CIO authority – some of the more achievable goal areas. While IT modernization remains an uphill battle, HHS made cultural changes to set the stage for future improvements, earning points on the FITARA scorecard. At the Department of Agriculture (USDA), we see positive progress, and areas where more work is needed. As the graph shows, USDA outperformed the average Federal score on DCOI (the Data Center Optimization Initiative) through its strong cloud push, and the MGT (Modernizing Government Technology) Act, with a working capital fund accessible to the IT department in place at the agency. However, the Dashboard shows that the areas of portfolio review and CIO authority took a big Pac-Man-like chunk out of the agency’s score. The CIO authority issue especially elicited frustration out of Rep. Will Hurd, R-Texas, then-chairman of the IT Subcommittee, during the most recent FITARA hearing in December. These findings are just a handful of what you can find on the Dashboard yourself. If you’re interested in seeing how your selected agency performed, check it out for yourself.